I intended to write a post about this movie, my experience with it, the twenty some odd times I’ve watched it, the tradition my wife and I now have with it, and on and on. But I’m not writing that post. I’m in the middle of edits for my next novel and they are eating up all my time. I did not want to throw together a shoddy post just because my brain is fried, and was, therefore, delighted to come across this post from The Art of Manliness. 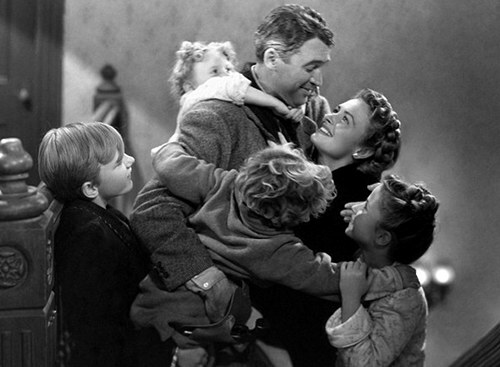 “The George Bailey Technique: Mentally Erase Your Blessings for Greater Joy and Optimism” is some very good advice. If you are looking for how to gain some perspective in this busy time of year, be it because of life stress or an inability to find that holiday spirit, follow the link. I will be crafting my next novel into the best piece it can be, and promise to report back once I’ve survived. Love the film, though as I get older “IAWL” seems to grow darker and darker. Not that the end isn’t a great payoff – who with half a heart doesn’t cheer Clarence getting his wings and George’s treasure that dwarfs Potter’s a million times over. But now I also feel the resentment and disproportionate sacrifice George carries…And it still pisses me off that Potter isn’t found out and arrested by Bert for grand larceny. That would make Bedford Falls truly festive, imho. Good luck with the editing, Eric. And happy holidays! Thanks, Shawn. I agree with those sentiments as well. George is unnecessarily burdened–a bit of a tragic hero, and Potter is simply a flat character full of spite. I love the SNL skit with the alternate ending where Potter gets it. I should post that.